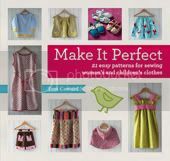 make it perfect: . 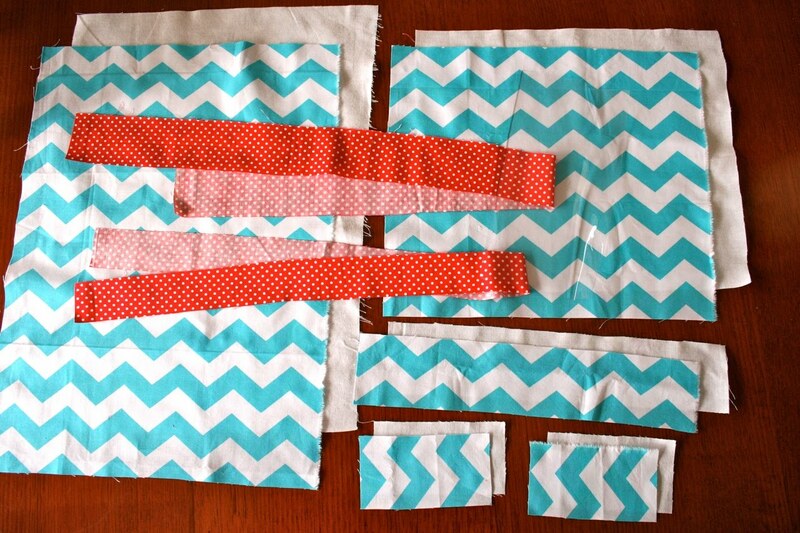 "Peek-A-Boo" Toy Sack Tutorial. Giveaway now closed - feel free to still leave a comment though! * Plastic window is clear PVC "tablecloth" plastic - this comes in 3 thicknesses (from Spotlight), I use the middle thickness because it is strong but thin enough to use your regular sewing machine needle on. 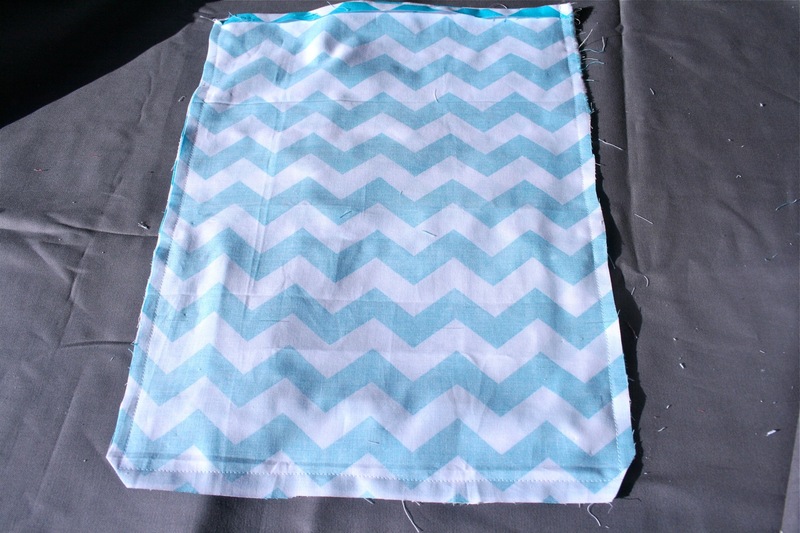 Take one of the 4 1/2" x 2 1/2" rectangles of fabric cut from exterior and lay on the table with right side facing up. 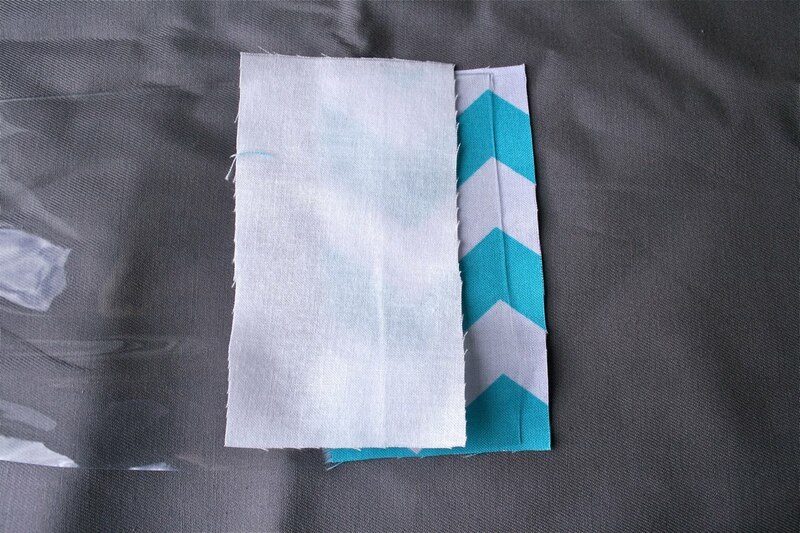 Take your rectangle cut from plastic sheet and lay on top of exterior fabric, matching up short edge of plastic strip with long edge of exterior fabric. Take one of the 4 1/2" x 2 1/2" rectangles of fabric cut from lining and lay on top of the plastic sheet with right side facing down. 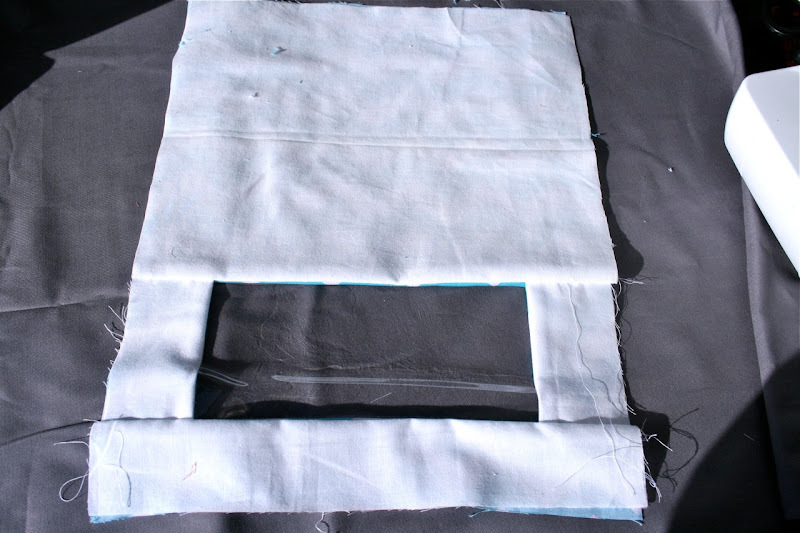 Match up raw edges (the plastic sheet should be sandwiched between the exterior and lining fabrics). Using pins on the plastic sheet will make holes, to hold in place, use a few paper clips along the raw edge. Sew together along paper clipped edge, using 1/4" seam. Repeat to attach other 4 1/2" x 2 1/2" rectangles of fabric cut from exterior and lining on the opposite short edge of plastic sheet. Fold fabric out so that wrong sides are touching. You can't iron near the plastic sheet, so firmly press seams flat with your fingertips. Take the 2 1/2" x 12 1/2" rectangles of fabric cut from exterior and lining and attach to the bottom long edge of the plastic sheet and side pieces of fabric in the same way you attached the side pieces. Match up raw edges and pin or paper clip into place. 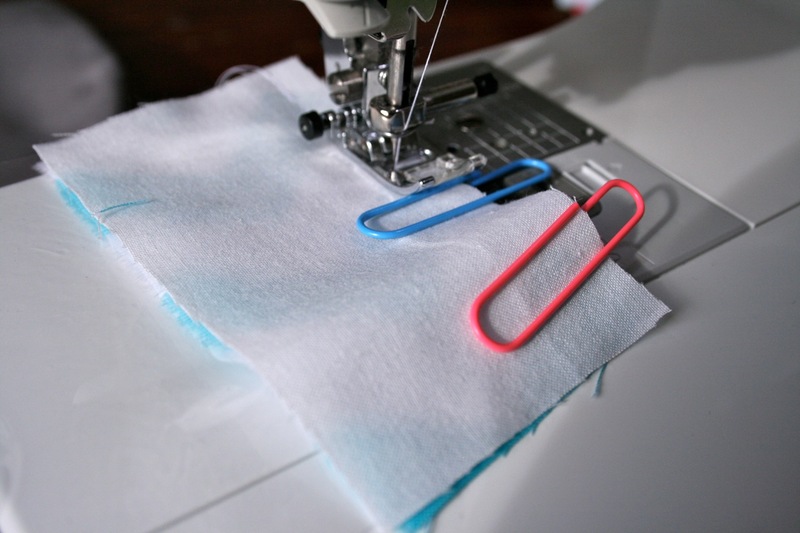 You can use pins where you are joining fabric to fabric. Sew along pinned/paperclipped edge using a 1/4" seam. 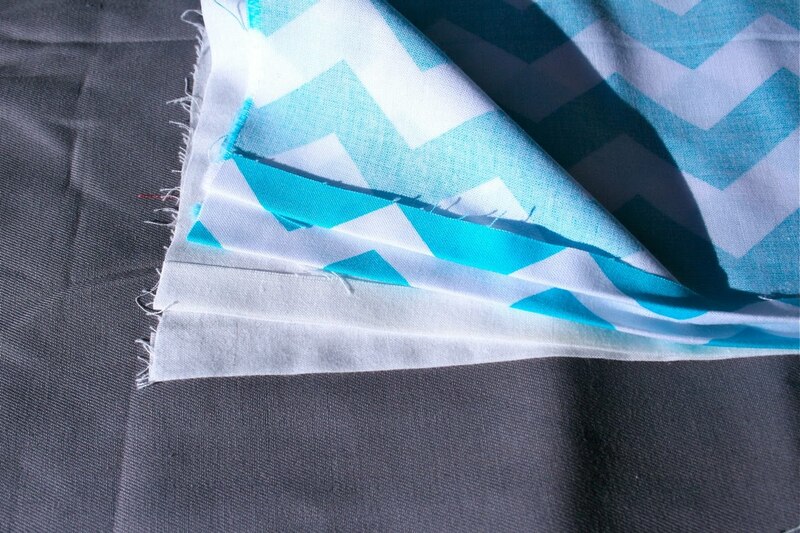 Open out fabric so that wrong sides are touching and firmly press seams flat using fingertips. 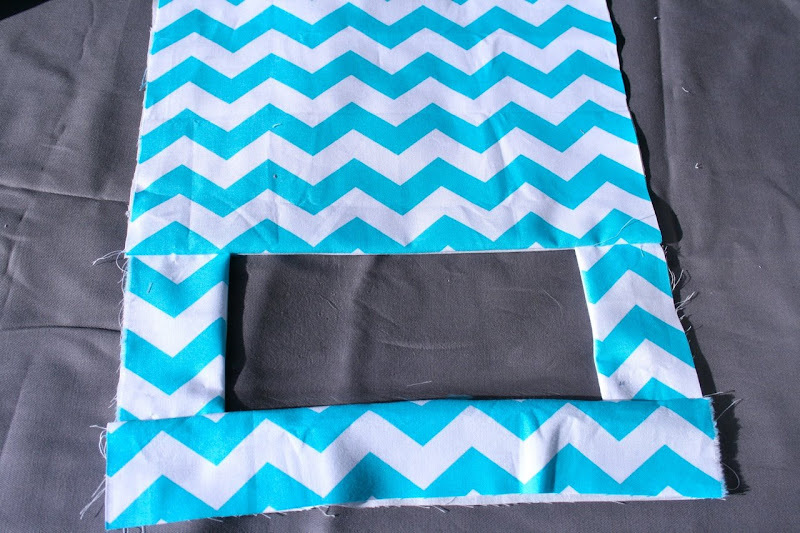 Take the 10 3/4" x 12 1/2" rectangles of fabric cut from exterior and lining and attach the top long edge of the plastic sheet and side pieces of fabric in the same way you attached the bottom piece. 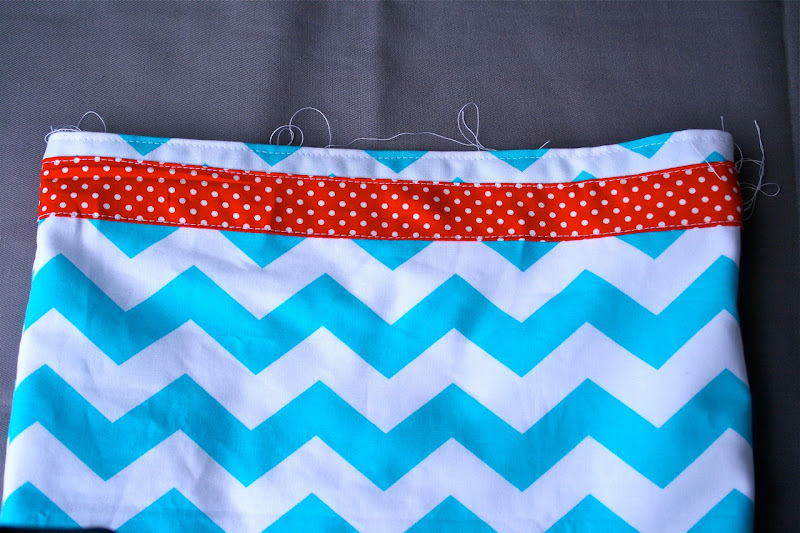 Open out fabric so that wrong sides are facing and firmly press seams flat using fingertips. Topstitch about 1/8" away from the edge around the entire window. 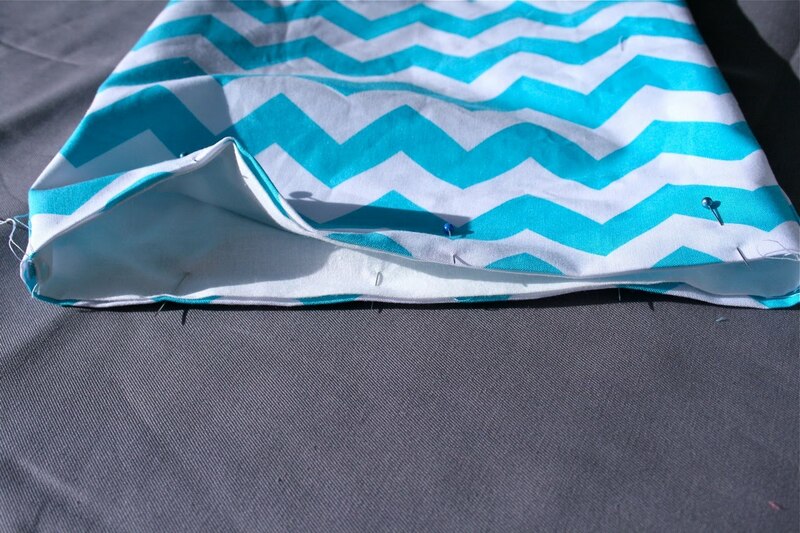 Make a hem at the top of the sack by taking front of sack and folding the right side of the top raw edge of exterior and lining fabrics under 1/2". 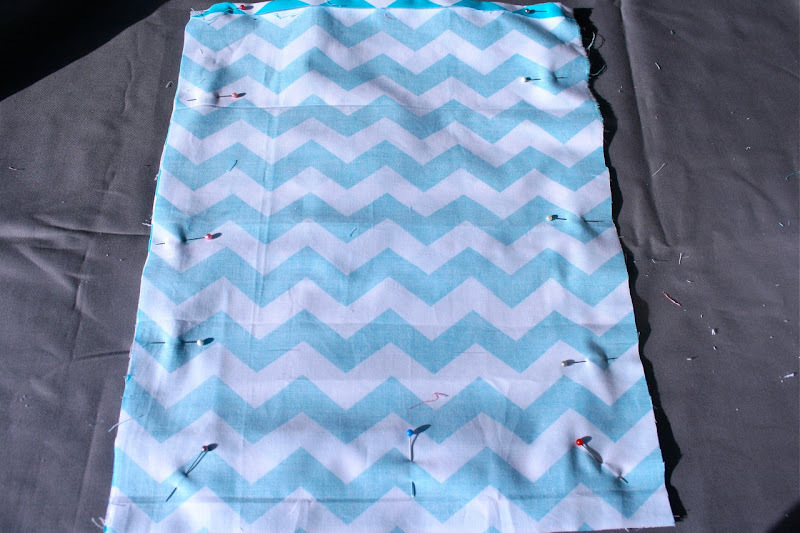 Take the 16 3/4" x 12 1/2" rectangles of fabric cut from exterior and lining and fold the right side of the top raw edge of both pieces of fabric under 1/2". Take lining back piece and lay on the table with right side facing up. Place front of sack so that exterior is facing up and front lining is facing back lining piece . Take exterior back piece and lay on top of the stack with wrong side up so that right sides of exterior fabric are facing. Match up top folded edges of all four layers of fabric so that they are perfectly aligned (this will ensure a neat finish to the top hem of your sack.) Match up raw side and bottom edges of sack and pin into place. You should have four layers of fabric pinned together. 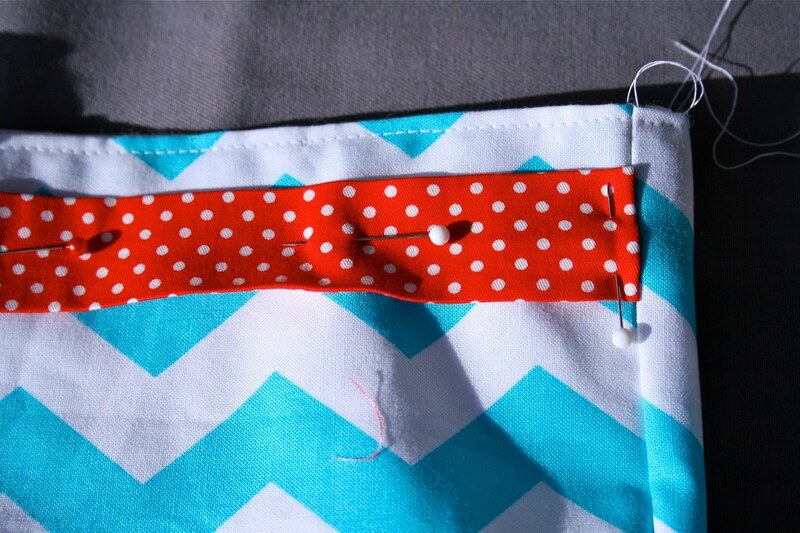 Sew together around pinned edge using a 1/4" seam. 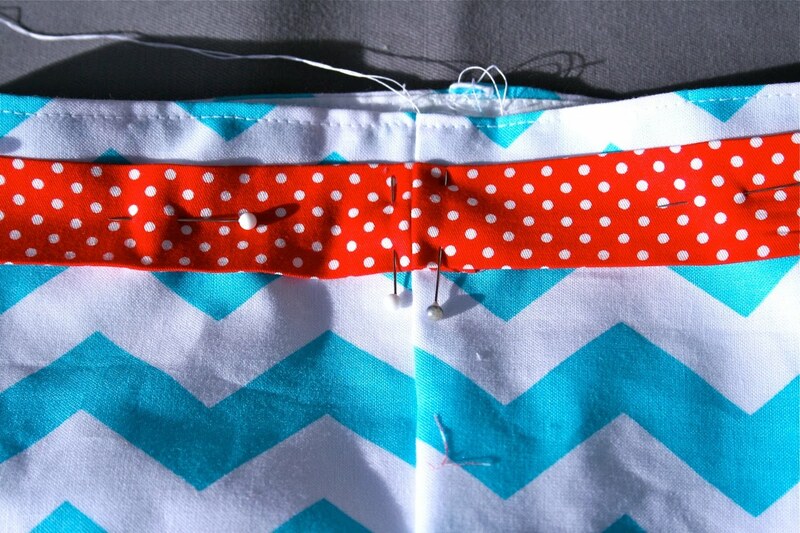 Trim bottom corners off sack, making sure not to clip your stitching. Turn bag right sides out, pushing lining fabric inside exterior. Match up top folded edge of sack and pin front exterior and lining pieces together and back exterior and lining pieces together. Sew around pinned edge, close to the folded edge of the fabric. 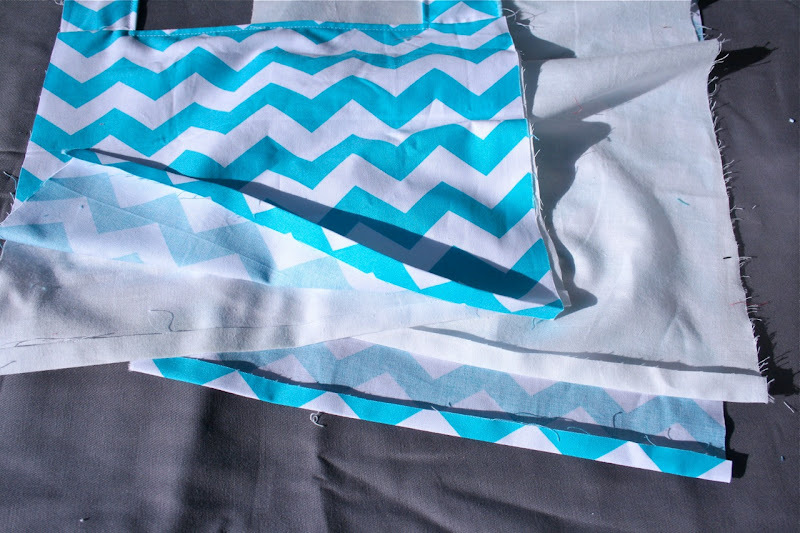 Take strips cut from contrasting fabric for casing and drawstring and make a center fold by folding in half, length ways, so that wrong sides of fabric are touching. Open out and fold both long raw edges of fabric in towards the center fold. 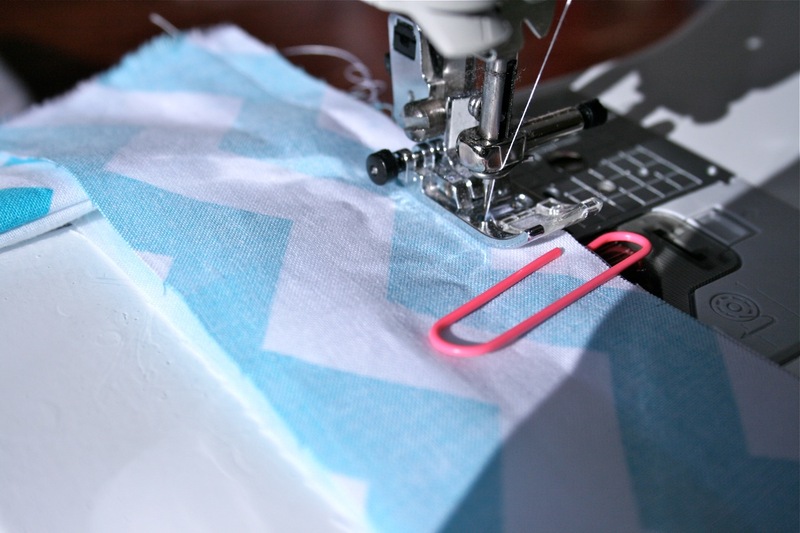 A much, much easier way to do this is to invest in a couple of bias binding makers...they are GREAT! Very affordable (I think about $10 each?) and make light work of making binding. The two I used for this project are made by Clover. The pink one - 18mm is used for the 1 1/2" wide strip of fabric and is the size I use most often when making clothing. The blue one - 25mm is used for the 2" wide strip of fabric. 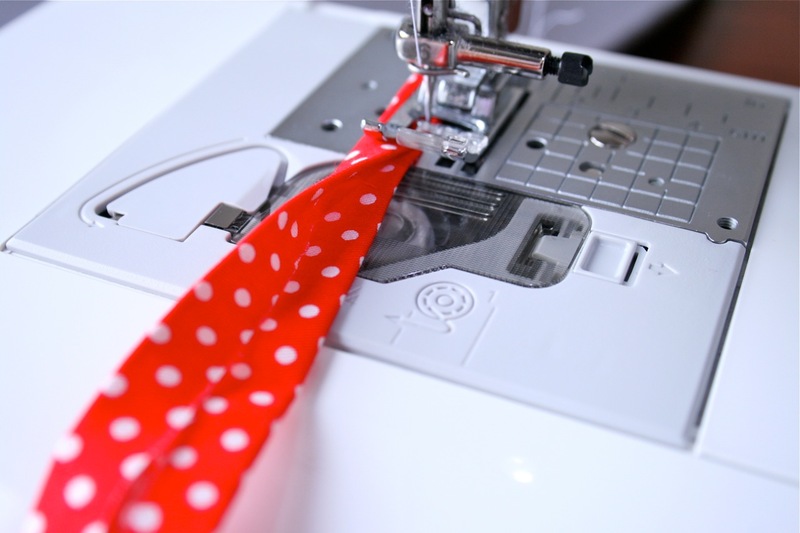 (Nicole Mallalieu has a great tutorial showing how to use these cool gadgets on her blog). Set thin drawstring strip aside for now. Take thicker strip for casing and fold one short raw edge under about 1/2". Press. 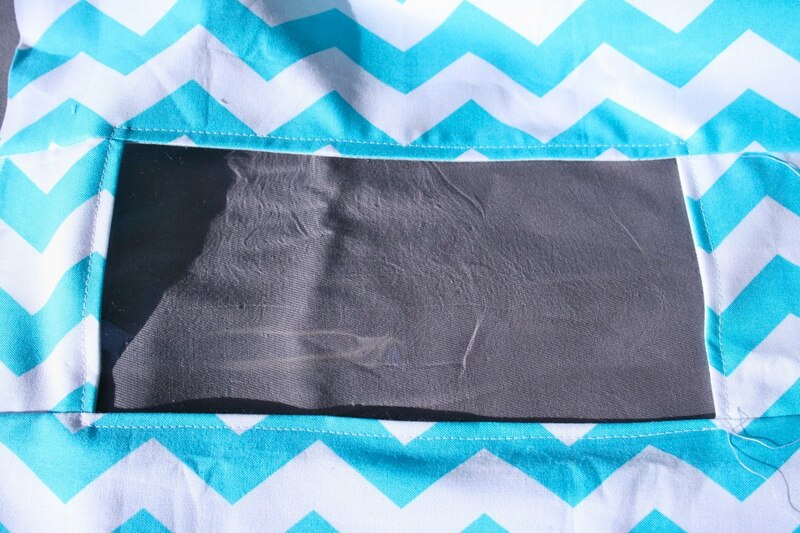 Align folded edge of strip with side seam of sack. Position strip so that it is sitting about 1/2" from top edge of sack and pin into place. Continue pinning until strip has made it's way around the entire sack. 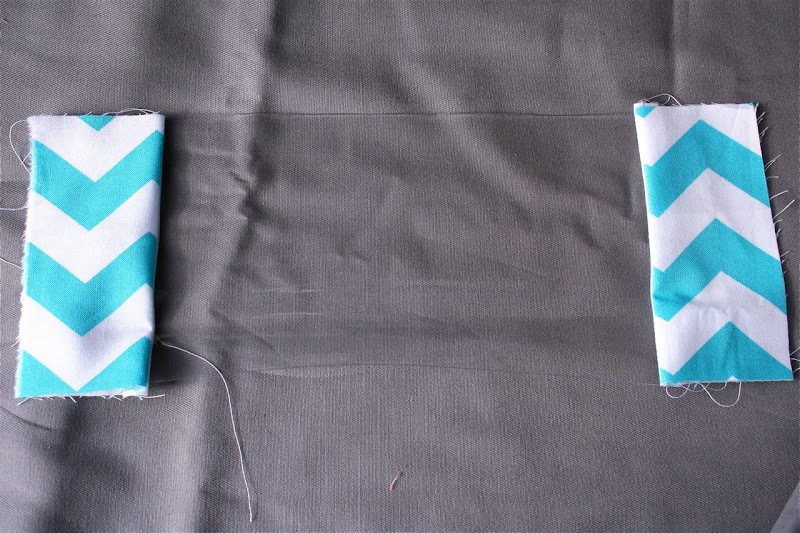 When you get back to the side seam you started at, trim the strip so that it overlaps the beginning of the strip about 1/2", then fold short raw edge of the end of the strip under 1/2" and align folded edge with the side seam of the sack. 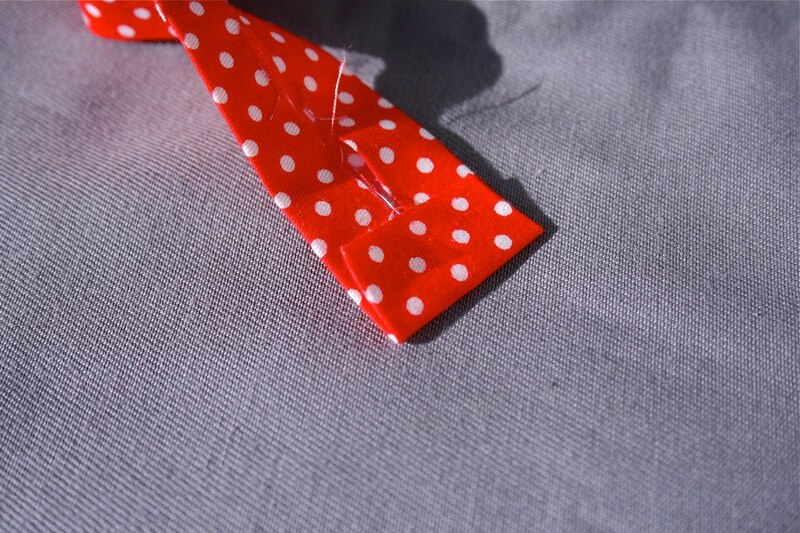 There should be an opening between the two folded ends of the strip, this is where you will insert your drawstring. Pin into place. 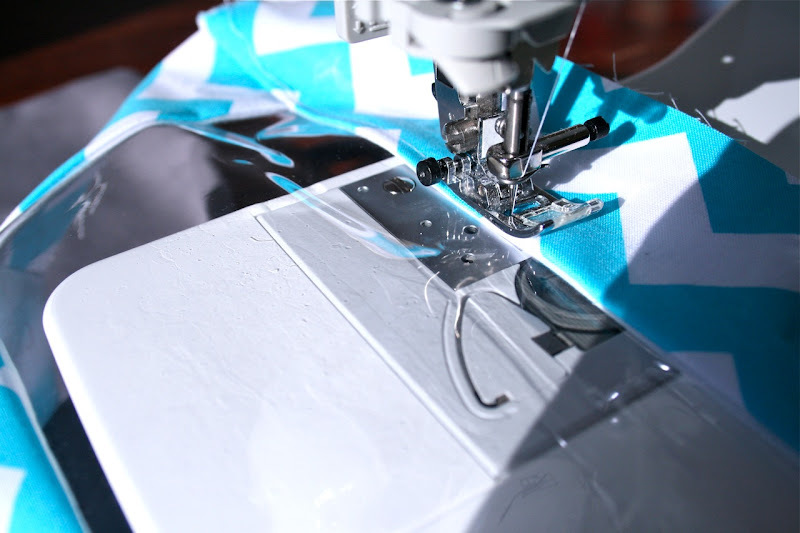 Sew around the top and bottom edges of the strip, close to the edge to secure strip into place and form casing for drawstring. Take thin drawstring strip and fold in half, length wise once again so that raw edges of the strip are enclosed. Sew down opened edge of the strip, close to the edge to secure. 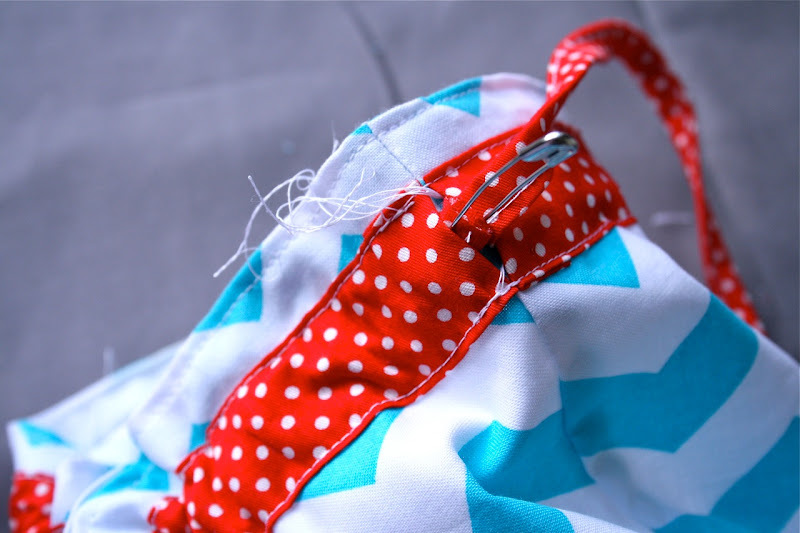 Attach a safety pin to one end of the drawstring and thread through the casing. Tie a knot at each end of the drawstring. Snip stray threads and you are done!! If you make a "Peek-A-Boo" Toy Sack, I would love to see it! Send me an email or add your photo to the Make It Perfect Flickr Group. 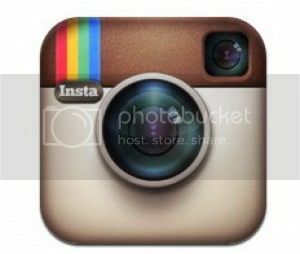 For an extra entry, become a follower of my blog and leave a separate comment to tell me that you follow. If you are already a follower, leave a separate comment telling me so and you will receive an extra entry too. I'm a follower!!! Love this!!! What wouldn't I use it for!! I think my two little girls would find a million different things to put in it! They usually use old diaper boxes! LOL But these are far cuter!! These would make great library bags, and great dance class gear bags, and great hair gear bags, for keeping flat iron, curlers dryer brushes etc. Oh my goodness!! Soooooo many uses but i would probably use it to store all the little bits and pieces that my girls seem to need in the car. As we live in the country and travel back and forth to Melbourne quite often we tend to spend alot of time in the car and manage to build up quite an assortment of "stuff"
Oh these are too cute love them Thanks for sharing the tute. I would use them for sorting the kids socks. A bag each for their school socks and then a bag each for their weekend/dress socks. Also wierd but one each for their underwear. They constantly complain they have none in their draws (despite owning atleast 30 pair each :0 ) If i keep them in these bags they won't be tempted to empty their draw into the laundry every day ggrrr. oooh I subscribe in Google reader. Apart from housing cars and trains, they'd make great storage for half finished craft projects and craft supplies. I'm a follower aren't I? i could use it to the girls DS things in there or maybe all of gary's bad jokes... does it come in a sack size??? Love the blue and red combo! Great tutorial! What a great tutorial.I would use it for lego, or my daughters arts and crafts, or even hang it on her door with her hats and scarfs in it. Or even maybe take it to ballet and have her ballet clothes in there. oooooh, endless possibilities. These are so cute Toni, much more stylish than the old pillowcases I've been using for Lego and Little People! I could see these being used to store kids craft bits and pieces, as activity bags for long car trips, for girls paraphenalia-brushes, lipgloss, hairdoodads. They would make nice knitting bags too- present idea for my mum! I could even put some of my UFO's in them- but they might never make it back out of the bag!! not sure but think I'ma follower noe? Your on my blog roll anyways! I think they would make great bags for sorting things in the kids suitcases when travelling. Easy to see which one has socks, undies, tops, pants etc without rummaging through everything. Or even have a full days set of clothes in each. Thanks for the tutorial and giveaway. The first thing that came to mind (after toys) was to use them for wool storage. Too cute :) Hmm....we would put the girls craft things in them, fabric scraps, feathers, bits and bobs...hours of fun! I'm a follower and fan! My son loves collecting things, he could this great sack for it! Tough question so much junk to be stored! The girls would both try to lay claim to it! You know I'm a follower. Great tutorial!! Thanks for sharing I can't wait to make my own sack. It will be great to store knitting/crochet supplies (yarn, needles)or use it as a lunch bags for children. Love your fabric combo, and dots fabric are lovely! What great bags...I will have to make one. What would I use these bags for....keeping the picnic plates etc in ...you can never find the bits you need so it would be good to hang them up under the stairs. Thanks for going to the effort of creating a tutorial and sharing it with us. No excuses now. So many options here....of course they would come in very handy for the topys, but would be great in my craft room, for the pool, in the car, in the pantry, or the bathroom...so many places!! I just became a follower last night US time. I am already in love with your "peek-a-boo" toy sacks! I've got the same problem at my house. Another use I would use these for is to keep mess kits in when camping, games to play at picnics, my daughter will even use one of these to keep all things girly in! I am a follower... I love your blog!! I also could use it as a night time bag to put pj's and bedtime story books in! I love this idea...I actually think it would be really fun for gift wrapping...a little "teaser" into the fun they will get to open and very green since they will not have to throw away the wrapping. Thanks for the tutorial...I will be making these soon! Very cute. I would use it to separate out toys. Cars in one bag, block in another....Very cute. Would love to win one but if not I will for sure make a few! Thanks for the great idea. found you today on Ucreate. I love this. I love these and can't wait to make some. Can you purchase the plastic in local retailers or only on-line? WHat a great idea. Thanks for the tutorial. If I win I think I will use my bag to organize our beach supplies..the snacks we bring to the beach everyday. This would be the perfect bag. Hmmm, let's see. 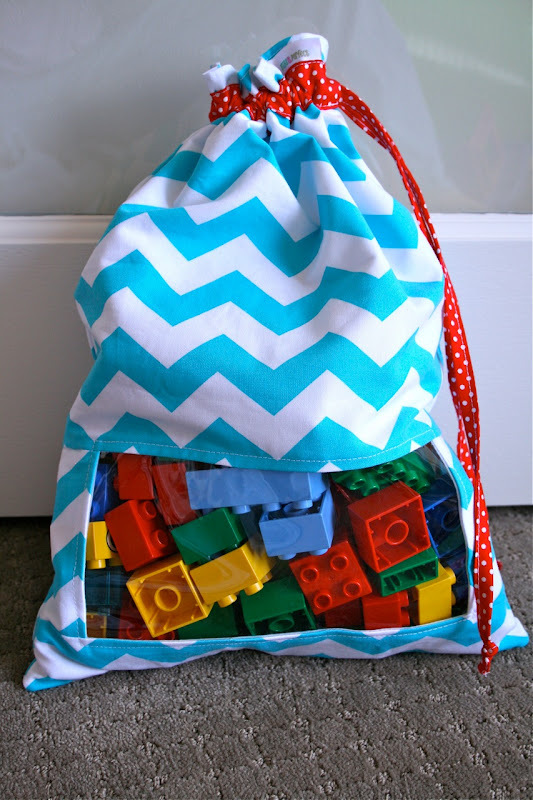 Another use of the bag could be to organize math manipulatives in the classroom. That is what I would use it for. The bag would be great to keep the small pieces to outside toys such as items for the water table or sand box. 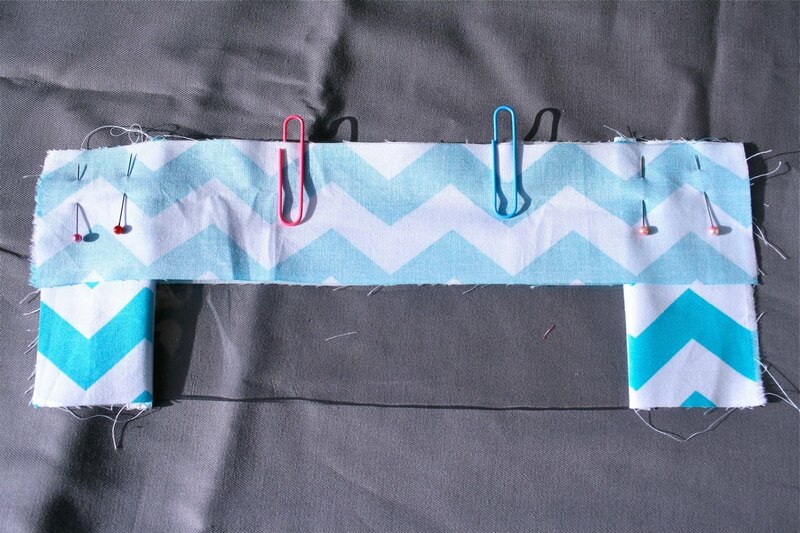 You can easily hang it on a peg board in the garage. Thank! Would make fun overnight bags too. my kids could no longer say I didn't SEE my toothbrush!! Thank you SO much for your lovely pattern! I would use these toy sacks for a toiletry bag, for holding unnder garments, shoes, or other things on vacation. You can never have enough little bags while traveling!! I think I will try to make some of these bags and give you all the credit for my inspirations! Thanks so much!!! Wow!! this is the solution to my toy organizing problem! even if I dont win I will make these! I think it would be cute to also stick gifts in them. I think we will use ours for the kids to pack up their stuff for the car to keep them busy. 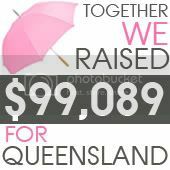 would also be great for craft supplies and knitting supplies! This would be a great bag for long trips to put store things in for the kids. Like on car rides or airplane trips. I am new to your site! I love these bags! You could also put a gift in these peek a boo bags, to give a little hint of what's inside! I would use it for other miscellaneous baby things like pacifiers and baby snacks. Very cute idea! They look like the perfect size for a day trip bag. Thanks. I came from u-create and am now a follower. I love this bag! What a fun idea! I am alway looking for a better way to organize all my son's baby stuff and my craft things. Right now they are in boxes in his closet! Such a cute idea! 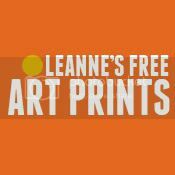 I'm a new follower found you over at UCREATE. I am a follower! I will be making multiple bags this weekend to control our toy clutter!!! I think this bag would be great to use for organizing bunches of things...safey googles in my classroom, mittens and scarves in the closet, lost and found items in the kitchen...i could go on and on!! Thanks for such a great tute! I'd use them to store sewing projects--a separate bag for each project. Right now I reuse those clear zipper/snap bags sheets and stuff come in, but these are much cuter. Then I'd just have to find the time and some motivation to actually finish what I started! love this project and hope that one day when i finally learn to sew i can make one too! I love the clear window. I would use these for project storage. Give some to my daughter for her crochet projects in the car. Use to pack kids outfits together on trips. Thanks for the tutorial. I love this! I would use it to hold knitting projects so the yarn could peek through that window! I subscribe to you on Google reader! Little Bastian would LOVE a Church bag :) I'm going to go get some material now, this is PERFECT. This bag is darling! I would use it to carry car activities for my children. I am a follower as well. what a great tutorial! i am always looking for fun, creative storage ideas. i would use it as a church bag i think. I am a sewer, but I still want to win this bag! This is just perfect for an afternoon in the park- waterbottle, sunscreen, snacks. I am a new follower, and I love your blog!! I can't wait to see more! I think my kids will use them also for toys and stuff they take on the summer holiday! But also in their rooms they will be very nice to use! Cute! I love the idea! And I'm in the midst of organizing the kids' toys, so it will be great to make some of these! I think this bag would be awesome for little girls dance classes or carrying your beach towel and all those beach toys. Great bag! 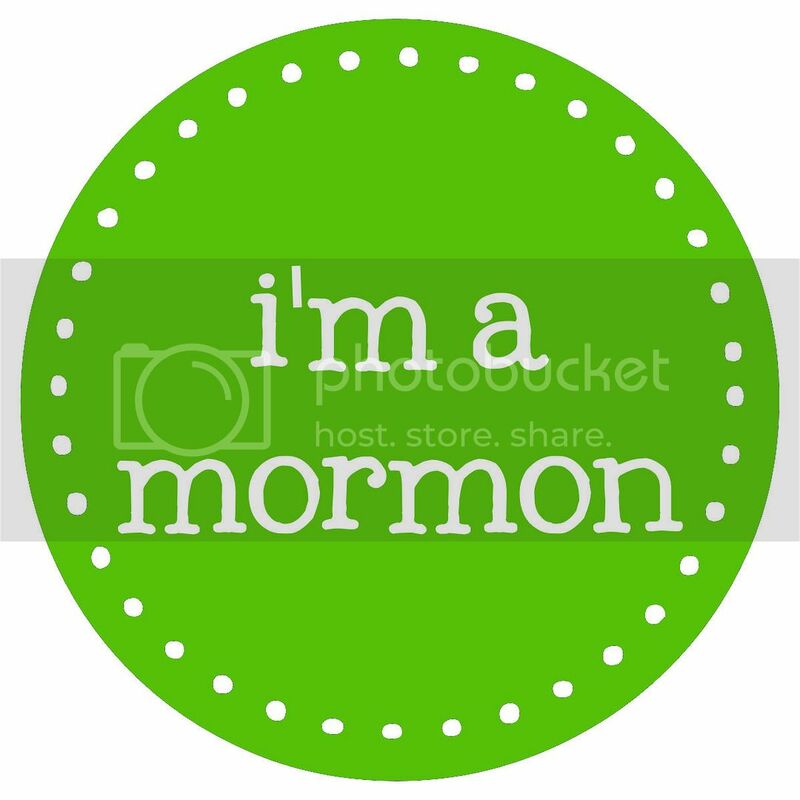 I am also a follower! Love these bags!! What a great idea. I'm now a follower. These would be great for church. I could put my girls quite books, coloring books, crayons and small toys in them. I'm sure they would love to carry this super cute bag to church every week. Love them- i would have one for Legos, one for ballet stuff, one far Gril Scout stuff, one for markers, one for make-up: must I go on? cool tutorial! Thanks for posting! Wish i could sew! I could use this cutie to store my baby girls's beach toys! LOVE IT! i'd put our wooden blocks inside..
Definitely going to be making some of these! Very cute! I would use it at the beach. I'm going to now follow your blog. 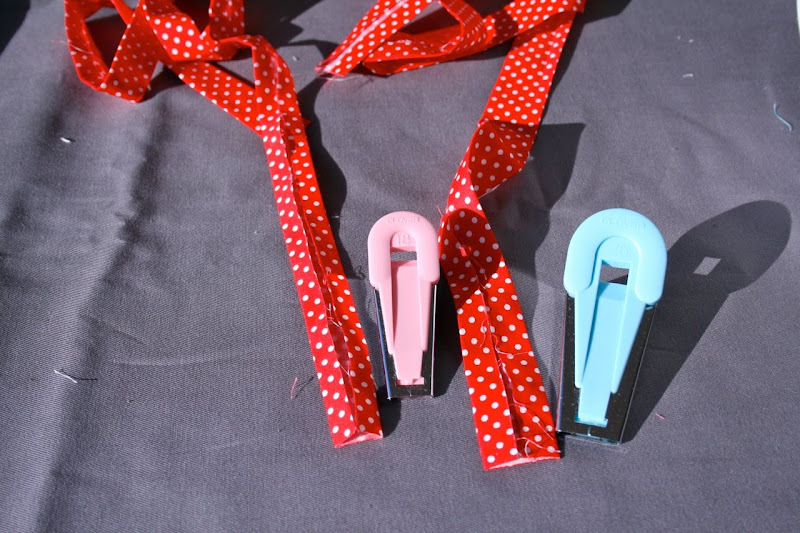 These are really cute and I can see uses for it to store my fabric scraps. Would love to win one so that I had one to go by. I would love this! We have so many things we could keep in it - blocks for sure! I am now a follower! Such cute bags! I'd use them for toys or for quiet toys to bring to church to occupy my 4yo. Fantastic tutorial! You come up with such great ideas. I would use it for the quilt I'm currently quilting. I'm a follower, I love your blog and your Toy Sacks!! You could use them to hold wool and other crafty pieces. Also accessories like scarves, beanies and headbands. I would like to have some hooks near the door for socks, beanies and scarves for winter! Love these! Great fabrics too. I'm a fan! The perfect library bag or car organizer! What a great tutorial. I love the idea that you can see what's inside. I would use these to also store shoes! I am also a follower now. What a great idea with the window. The ones I have made don't have such a fancy feature!!! With the window they'd be fantastic for storing shoes in - tidy but still able to find - and both shoes in one place, that would be a change!!! Love them! Off to make one now...i even have some of the plastic! Thanks for the tut. Shelley.. I love these! I run training and end up carrying around colored pens, post-its, bluetac, staplers, tape etc. This bag would be perfect! I love this tutorial...I am almost done making one for a gift and I have only been at it for 30 minutes, cutting included. Thanks for sharing. I'm sure it will be loved by all. I love these bags! My friend and I were just talking about needing some sort of organization for small toys. I will definitely be making a bunch of these, but I would love to win one too. I am a new follower. Thanks! These bags are adorable! They would be great for "to go" items when going to town. My girls always have to take some toys when we leave the house. That's a beautiful bag. With 3 kids, the most obvious thing for me would be to differentiate whose toys are whose but I'd love to use it to sort my different crochet projects. Or a a gift bag for a birthday present. I would maybe use them for swim gear...each child would get their own...and maybe sew some straps on them! Love the idea. I would love to use it for myself... as I am always seraching around the bottom of my bag for my keys, wallet, phone, lip gloss, mints etc !! LOL !!! This is a very generous free tutorial, well done and thank you very much!!.! 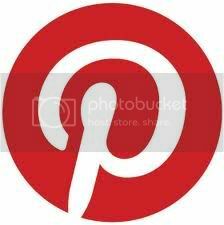 Have just become a follower(don't know why I haven't done it earlier}. I'm off to find some plastic now. I love this idea. I know my daughter would love to use something like this to tote her craft things around in. I am going to make a bunch of these. Fantastic! Thank you for the great tutorial! Brilliant idea, I'm making some. My little people are driving me spare with all the blocks that fly out of the toy cupboard because they've got no home. I'm going to make one for my hubby in boofy bloke fabric so he stops shoving his wallet, phone, floss etc into my already pregnant handbag....I'd become a follower but I'm techno-challenged...you're in my "favourites" though!! Okay - so, I'm a scrapper, paper crafter, etc. I would/could use the peek-a-boo bag for holding my misc stuff like ribbons, buttons, etc that I can't seem to find a perfect container for. I'm also a PreK teacher, so it could be used as a "guess what's inside me" type game (only all you have to do is turn it around to see). We've done this before where they have to guess with clues what's in the bag. Hmmm...now I'm wishing I was a sewer (if that's even a word). Love this idea, these would also be great way to keep family members clothes separate during trips. I would use this for crafty supplies and my girls hair things. It would be great for anything small that I have a lot of. Adorable bags! Oh, what else could I use this for (seriously though...toys is #1). I could see using it in the car to hold my daughter's trinkets. I could also use it in my crafts room to hold ribbon. In the laundry room to hold those "lost socks" until the mate appears. The possibilities are endless! I follow through Google Reader (if that counts)! Love your ideas! Our nieces/nephews are now getting married and having babies, so old Aunt Sandra is going to make a stash of these for gifting purposes - thank you so much for the idea and for the great tutorial! I would use it for knitting... it would be easy to see just what was in the bag instead of having to open the bag first... many times I have several projects going at one time so this would be fantastic! I would use it for coloring supplies that we take to church each week or diaper stuff for the car. So cute! Hiya! I would use this to organize my girls' hair accessories--brushes,clips,bows,etc....and just hang it up in the bathroom! Pretty!!! I'm a follower now too! I think this would be perfect in my sewing room for fabric scraps! This way I can find my ribbing easier!!! Love these bags! In addition to kid's toys, I think they would be great for craft supplies. I am now a follower. so excited! I am an RSS subscriber. I'm thinking that the peak-a-booness would be well used as a way to stash craft projects in progress. Readily accessible (hung up on a peg or hook) with all the materials pulled and grouped per project,peeking happily through the window reminding me to finish up said project and not waste resources rounding up more materials or buying supplies that I already have. We could use them for my daughter's hair bows, or her markers and crayons. These would also be soo perfect for take along toys in the car!! LOVE THEM!! This is just too cute. There are always many uses for a drawstring bag but I'm thinking of putting my daughter's spare clothes for daycare or maybe her lunch. Thanks. Fabulous! Like a lot of creative people with little time, I have a lot of projects on the go at once; so handy to keep all the bits and pieces for each project seperate but easily identifiable when you want to get it out again. That's a fun little bag! How nice of you to post the tutorial for us! This bag might be perfect for putting your frozen and refrigerated food in, for unloading it first when returning home with your grocery shopping. Shoe bags! Keep the dust off and know what's inside. Also great for travel! Awesome bag and great tutorial. + follower I cannot believe I have not found u before! How about using it as a bag to take along to swimming lessons. . . 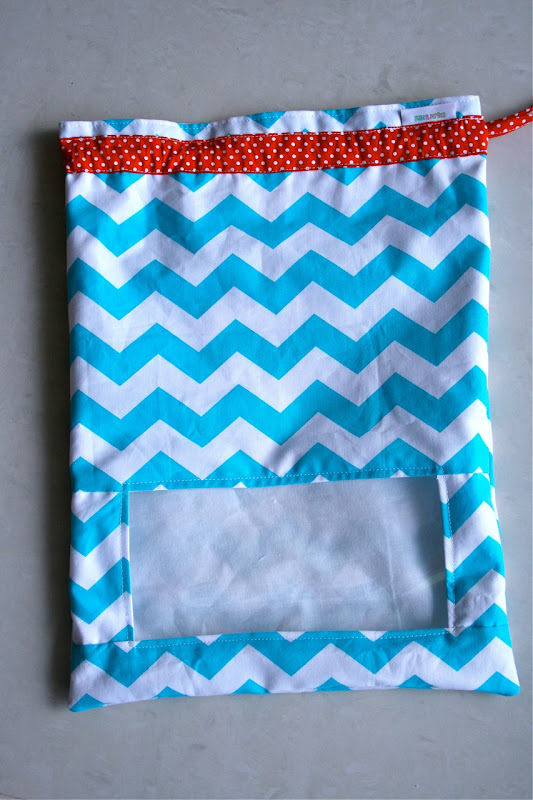 These are so cute & would be great for so many things~~sleepover bag,Shower bag when camping,Pet Toys,Make-up,sewing supplies & even individual craft projects!! Smaller ones for First Aid travel kits! Would love to win this & thanks so much for the Tutorial!! **Thank you!**... what a wonderful tutorial!! I just whipped one of these great bags up for my DDIL's knitting!... And will be cutting out lots more for my grandsons' toys and collections! What a wonderfully clever idea!!.. I want lots of these to organize my sewing room!!.. And some of the first ones in there will be to tame my elastics and stretch laces!! I'm now a follower of your creative blog!! Thanks, again, for the tutorial!! What a great tutorial! I would love to win a model to use to make more from your give away! It is the perfect Lego bag! I'm thinkin I would use it for snacks in the car, looks to be easily washable! that's one of those 'why didn't I think of that' ideas! thanks! this would be perfect for library books! Oh wow! This is such a great idea and really, really cute! I just clicked over from Craft Gossip and I'm so glad I did. I would love to link to this if you didn't mind. What a cute bag! I would let my kids take it on our daily nature walks to hold all of their "treasures". genius :) i featured you today! What a great idea!!! You wrote a very easy to follow tutorial also. I had not come across your blog until today but you are sure going to be on my feeds from here out. My "kid" is 16 but I can still think of some great uses for these bags!!! I love your Tutorial. They have always picture and are clear. DARLING idea! This would be a great way to store all of my daughters fashion scarves that are stuffed in a drawer currently. I'm a follower not too! I want to be a follower too! I've watched your posts on FFD and I saw this one and was very impressed! I'd love to have one of these peek-a-boo bags for all our fisher price little people we have or maybe to store our hot wheel cars in. The possibilites are endless! Fantastic - why didn't I think of this? We just got a bunch of hand me down toys and need something like this badly. Of course, I've got other uses...we just got a bunch of hand-me down socks and clothes that don't quite fit yet.